What You Need to Know for Home Game #7 vs. Fresno FC U23! Single-Game Tickets and Season Youth Passes are still available by clicking here: sfglens.com/tickets. General Admission for Adults is $10 and all fans 17 and under are FREE the entire season by “purchasing” their Youth Passes online at the same link: sfglens.com/tickets. Join us for our USL PDL season finale as we take on Fresno FC U23! It will be Fan Appreciation Day and SF Glens Evolution Day. The team will honor the SFGE youth coaches and players, and for the fans, there will be several prize giveaways, including free tickets to Fight Night at the SF Fairmont later that night, courtesy of Hard Hitta Boxing Promotions! Because you love the Glens, of course! Or because you love soccer, especially SF soccer and want to support your local club as we make history by playing in the USL PDL for the first time this season! Or because you had a great time at our first six games and you’ve found the perfect way to spend your Saturday, complete with beer, wine, and food for the afternoon! • Take BART to Balboa Park BART station. • There are J, K, T and M light rail stops at Balboa Park. We suggest using these directions if someone (friend, Lyft, Uber, taxi) is dropping you off. Otherwise, scroll down to the Parking section below this section. • Turn right on Havelock St.
• Turn left on Havelock St.
• Take 280 and head north. 1) City College of San Francisco for $3. 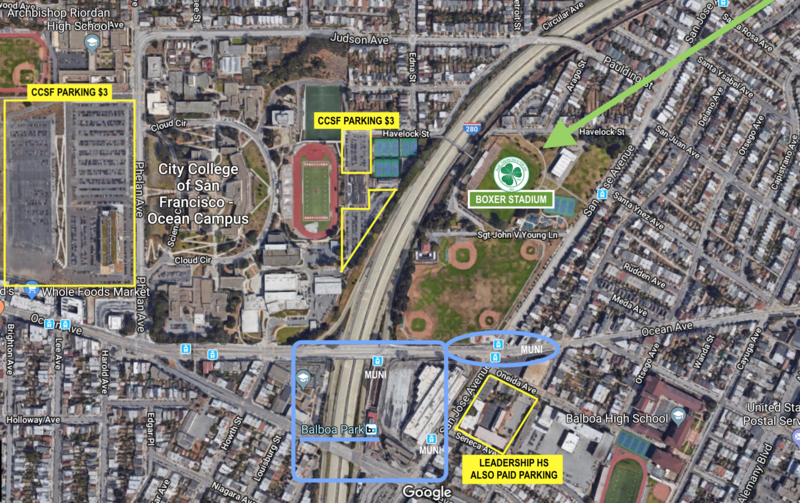 The lots directly east of CCSF’s football/soccer fields (368 Havelock St.) are the ideal place to park, as they are only a 4-5 minute walk to Boxer Stadium. 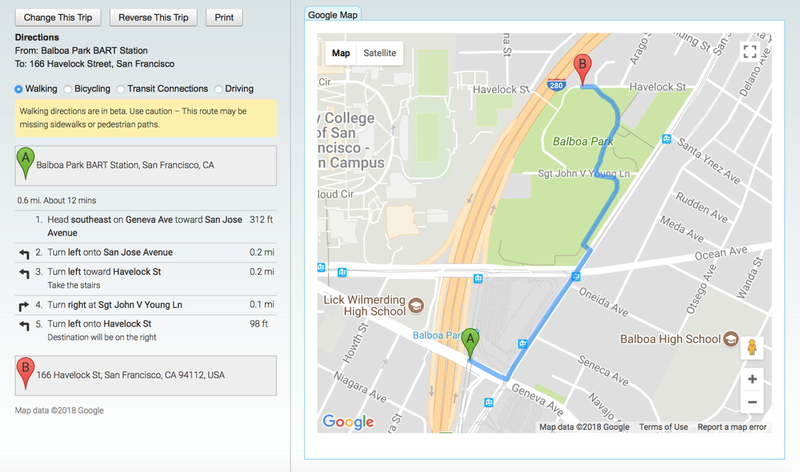 CCSF also has parking lots behind Whole Foods (15 Phelan Ave.) for $3, and the walk from there to Boxer Stadium is 15 minutes. 2) Leadership High School (350 Seneca Ave.) also has parking available for $5. It’s a 10-minute walk from Leadership HS to Boxer Stadium. On behalf of the San Francisco Glens and the Premier Development League we are committed to creating a safe, comfortable and enjoyable soccer experience for all guests in and around our stadiums. Fans should enjoy the soccer experience free from fighting, thrown objects, attempts to enter the playing field, political or inciting messages, and disorderly behavior, including foul, sexist, racial, obscene or abusive language or gestures. The PDL and its Clubs thank you for adhering to the provisions of this Code of Conduct and for making this event special and memorable to you and your fellow patrons. Founded in 1961, the San Francisco Glens have been a mainstay of the San Francisco soccer landscape for decades, winning numerous titles in the historic San Francisco Soccer Football League and competing for national titles throughout the 70s, 80s, and 90s. The addition of the San Francisco Glens’ PDL team is the latest evidence of the club’s growth. Along with the Glens’ youth club, SF Glens Evolution—a U.S. Soccer Development Academy member and official North American partner of Celtic FC’s Academy—the Glens are the largest soccer club in San Francisco, providing all levels of competition to nearly 1,500 youth and adult soccer players. To learn more about the San Francisco Glens, visit SFGlens.com and follow the club on Facebook, Twitter, Instagram, and Snapchat—all using the handle @SFGlensSC. A part of the United Soccer Leagues, which also operates the Division II USL, the newly-announced USL Division III, and Super Y League, the USL Premier Development League (PDL) has served as the proven stepping-stone for aspiring professionals. Over 70 percent of all MLS SuperDraft selections since 2010 have PDL experience, including a total of 66 alums chosen in 2018. Among the many players to have played in the PDL before making their professional debuts include Newcastle United FC defender DeAndre Yedlin, 2017 MLS Goalkeeper of the Year Tim Melia, 2017 MLS Defender of the Year Ike Opara, and U.S. Men’s National Team members such as Darlington Nagbe, Brad Guzan, Geoff Cameron, and the Bay Area’s own Nick Lima. ©2019 San Francisco Glens Soccer Club / SportsEngine. All Rights Reserved.